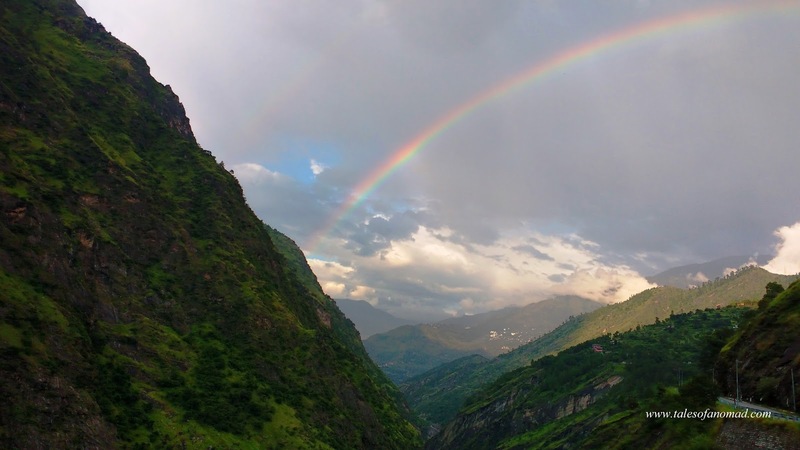 As I entered Kinnaur, it drizzled a bit and then a large rainbow showed up. Was that a welcome gesture? Soon it turned colder as the evening sky set in while I gleefully rode through NH-22, the old Hindustan- Tibet road, considered by many as one of the most dangerous roads in the world. With roads cutting through mountains, rocks protruding as covers, deep valleys and endless mountain stretches, all that I did was enjoy the ride and take in the fresh mountain air. Darkness engulfed by the time I took the diversion at Karcham Dam. From then on it was just the rumble of the royal enfield, silhouettes of the giant mountains and the gurgling of a river way below that gave me company till Sangla, 18 Kms away. The road was narrow, occasionally a vehicle passed by and I had no clue what I was riding through. 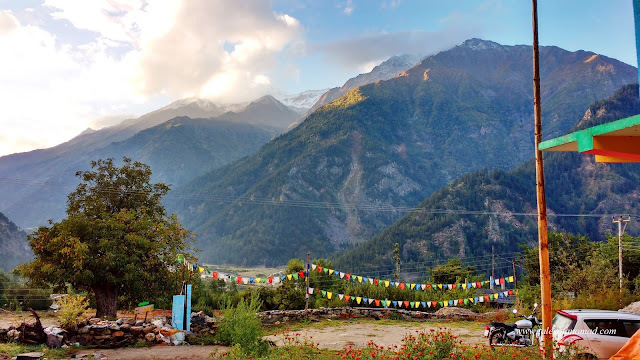 When I reached Roojoom Backpackers Guesthouse in Sangla, Joey, the owner told me that the road from Karcham to Sangla has spectacular views and is also pretty dangerous at night. The long ride from Chandigarh to Sangla took me 12 hours and all that I wanted at that point was a quick shower and warm food which the guest house provided. As I went off to sleep, Joey mentioned that I would be able to see some magnificent views when I wake up the next day. As I opened the door next morning, I was flabbergasted with the view from my room. Mountains stood tall and intimidating staring down at me and the valley below had Baspa river languorously flowing. While clouds covered a few peaks, others had ice caps on its summit. Probably this is what it means to say- 'Wake up to the mountains'. It seemed like I had woken up in a surreal land. How true was Joey with his words the previous night. 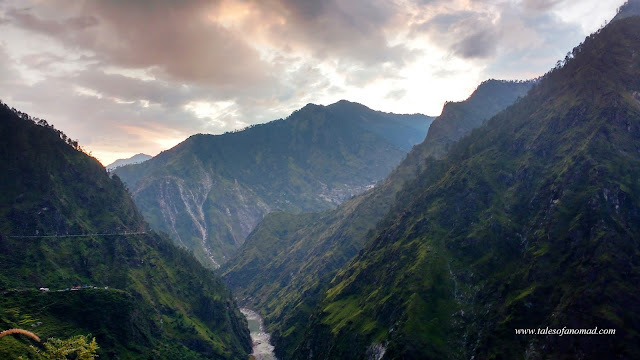 Sangla is probably the prettiest region in Kinnaur with encapsulating mountains, gorgeous valleys, endless vistas, winding roads, apple orchards and friendly people. River Baspa has Sangla valley on its one bank and Baspa valley on the other. Post the monsoons, Sangla valley blooms with ogla fields (a locally grown grain), flowers and apples spreading an array of colours. With the snow capped mountains in the backdrop, Sangla valley definitely seems like God’s own valley. A quick breakfast later, I was riding through the winding road that led further to Rakcham village. Endless stretch of mountains and the beautiful Sangla valley were the constant views with herds of mountain goats creating traffic jams. The vistas are so luring that they make you stop frequently and gaze at them in oblivion. Rakcham which lies enroute Chitkul is the prettiest village I have ever visited. Wooden houses in typical Kinnauri architecture adorn this village. A stroll through the meandering pathway took me past many lovely houses and villagers to the beautiful temple. The wooden temple has intricate carvings all over. I strolled ahead and the path led me to a bed of pink flowers which looked picturesque against the serene surroundings. After loitering for a while, I headed back to the road, crossed over and went down to the bank of Baspa river. The river was quite ferocious, a stark difference from what I gauged of it earlier. The bridge here that connects Rakcham village with the Baspa valley offers nice views of the Baspa river. As I rode ahead, spotted numerous camps by the bank of the river, which I was told offered many adventure activities too. However, the magnanimity of the landscapes ahead was too luring and I just couldn’t take my eyes off them as I headed to Chitkul. There were numerous stream crossings, most of which have bridges over them and one check post, a few kilometers before Chitkul where I had to enter my details and show an identity proof. Considered to be the last Indian village before the forbidden lands of Tibet, Chitkul is also the highest village in this valley. With vast mountains surrounding it, the tiny hamlet of Chitkul seems like the last point were civilization exists. The road leads further to Nagasthi village where the border outpost stopped me from going further ahead. Chitkul lies on the Indo Tibetan trade route that once existed and all that I could do was glance at the mountains and envisage the golden times of a borderless world. Back in Sangla, a short but incessant drizzle greeted me as I headed to Kamru fort. The climb up to the fort goes past numerous houses of Kamru village, apple trees and temples. The intricate carvings on the front door of Kamru fort are quite an attraction. As per customs, all visitors are requested to wear the Himachali cap and a tie a thread around their waist before entering the premises. The fort is more of a vantage point with gorgeous vistas all around. Apart from a temple, the fort also houses a mahal which was used by the Kings of Rampur Bushehr state earlier. Enroute the fort, I also visited a small Buddhist monastery, where a young monk was quite keen to open the prayer room and showed me around. Next day early I left for Reckong Peo and it was only then that I realized what I had rode through two nights before. The road from Sangla to Karcham is definitely an adventurous stretch with terrifying gorges, spectacular mountain stretches and the narrow road snaking along the slopes which is sure to bring out the intrepid traveller in you. Karcham has a huge hydroelectric project built over river Sutlej, which also has resulted in numerous trucks plying on the gravel road. Not sure what the reason is, but Sutlej definitely doesn’t look like a river and seems more like a huge canal with grey waters. Beyond Powari which has a strong army presence, the road turned better and a deviation to the left took me up to Reckong Peo. Reckong Peo is a fairly large town and is the administrative capital of Kinnaur. Though the town as such doesn’t have any major places of interest, Chandika Devi temple at Kothi has magnificent architecture and a lovely backdrop of the snow clad mountains. Brelengi gompa nearby is another attraction. However, the monasteries were closed when I visited as there were major ground works happening near it. Most people see Reckong Peo as a pit stop on their way up to Kalpa, and I was no exception. As I rode up, the snow clad Kinner Kailash slowly loomed in front with the views getting better as the winding steep roads took me to Kalpa. Believed to be the winter home of Shiva, Kinner Kailash is often referred to as one of the most beautiful peaks in the Himalayas and I couldn’t differ much. The view of this mountain stretch is probably the most beautiful of all the peaks in Kinnaur. All I did was to stop intermittently and gaze at the spectacular natural formations covered in snow and engulfed by clouds. Kalpa is a striking mountain hamlet lined with apple orchards, a few houses, a small market, temples and a monastery. I was surprised that within a few humdred meters, I exited the village. Narayan Nagini temple complex is a prominent place to visit. With a mix of both traditional Tibetan Pagoda style of architecture and Kinnauri architecture, this temple is a magnificent creation. Just behind the temple is the Chandika Devi fort which houses a primary school and a beautiful temple with intricate carvings and works. The premises also offer views of the Kinner Kailash peak and the surrounding mountain ranges. Am not sure how the students in the school can concentrate with such alluring views behind them. The thousand year old Lochawa La-Khang monastery nearby is another important attraction. With fluttering prayer flags, numerous prayer wheels and a chorten, the monastery stands beautiful against the lovely backdrop. The biggest attraction of Kalpa after the Kinner Kailash view is the suicide point. I rode past Kalpa towards Roghi village, enroute which lies the suicide point. This point has a sheer drop and stares down the gorge. This is best captured from a few meters down the road as it also offers the views of the mountains behind. There was no end to the views of Kinner Kailash as the restaurant where I had my lunch too offered lovely views of the same. Post lunch, it was a long ride back to Sangla with beautiful vistas for company all through. The last day of my sojourn in Kinnaur began with a ride early morning to Nako, more than 100 Kms away. The roads were absolutely pathetic all the way till Pooh with road widening, rock drilling and many other works that have made sure that road remains a dirt track with stones. The mountains are so craggy that it seemed like I was on another planet. Amidst all this, Satluj runs parallel to the track for almost the whole stretch. After a quick breakfast at Ribba and after providing my details at Akpa check post, it was more winding roads through the barren mountains until Pooh, from where the roads were well laid with tarmac. However, the landscapes remained the same, but the confluence of Satluj and Spiti rivers with Mt. Leo Prugyal in the backdrop at Khab was a beautiful sight. More vistas and views of winding roads way below were a delight. Landscape showed colours as I neared Nako as green and yellow trees sporadically appeared. Nako is a very pretty village popular for its monastery and lake. Though geographically located in Kinnaur, the influence of the Spiti culture and lifestyle is very evident in Nako. So are the landscapes which seemed much less greener than Sangla and surroundings. Riding through the narrow mud road of the village, I reached Nako monastery, perched at a height overlooking the high mountains and the deep valleys. Though the monastery remained closed, the outer facade was itself an attraction with beautiful works and colours. A short distance away from the monastery is the pretty Nako lake surrounded by trees and the village in the background. From Nako the roads meandered its way down and took me to Chango, another small village known for its monastery. The monastery is a couple of kilometers away from the main village and is located high up on a mountain with apple orchards surrounding it. Facing the mountains, this monastery seemed cut away from the village below. Only a couple of young monks were around as I walked into the inner sanctum. Amidst the colourful interiors, a statue of Buddha looked out facing the gorgeous mountains. I walked around for a while and then rode back to Sangla, the picturesque region of Kinnaur. You can stay in Sangla or Kalpa, and visit all the above mentioned places. Kinnaur requires a minimum of 3-4 days to explore. Though summer is the preferred season to visit, Kinnaur looks gorgeous after the monsoons. Winters are pretty cold in Kinnaur. Nako is far from the other locations and requires a full day to visit. The views are breathtakingly beautiful and the roads are pretty narrow on NH-22 and further to Sangla. Do make sure to concentrate on the road while riding your steed. Located in Himachal Pradesh, the villages of Kinnaur remain pretty much secluded. The nearest airport is at Shimla (237 Kms) and the closest rail head is at Kalka (302 Kms). There are buses connecting all the regions of Kinnaur but aren't frequent. It is recommended to travel in your own vehicle or hire a taxi. There are numerous stay options in Sangla, Kalpa and Reckong Peo. Chitkul, Rakcham and Nako too have a few home stays. I stayed at Roojoom Backpackers guesthouse in Sangla. Sangla also has many adventure camps located by the Baspa river. A mix of both Indian and Tibetan food is available at all these places. Amazing! Loved your pictures and narration. Brought back memories of my ride there! Loved the pictures and post ! Hope I visit it some day.. Thank you. Am sure you would love it. Yes... September is the time for Kinnaur! This summer I found Roojoom to be houseful. Anyway, I found another good alternative. Yeah, September is probably the best time to visit Kinnaur. Which was the alternative option? I could probably check out that place next time. woowwwww the best blog, Yes this blog is the best blog i have ever seen. which month did you visited it? Enjoy your stay. I went in September.